Let’s get your guitar and bass sounding proper with the best guitar tuners. Quick answer: the Peterson StroboPlus is considered a top-notch industry standard tuner, but the Peterson StroboClip is best value for money, and the KLIQ UberTuner for the cheapest that we recommend. If you want to see the full list, plus read the reviews and the buying guide, take a look at the rest of this post. You’ll be introduced to some of the best tuners for guitar and bass, understand why we think they are great, and why they’re the most recommended. You’ll also receive a brief overview of what a tuner is, about its functions, and what sort of tuners there are that exists. You’ll find that there are several options to choose from — one of them best for you. 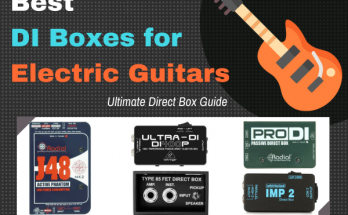 By the end of this post, you should have a clearer idea of what sort of tuner you want to get for your guitar or bass instrument. 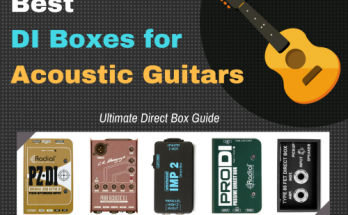 So if you’re a studio owner, tech, instrument maker/repairer, musician, student or teacher, enthusiast or pro, there’s a tuner in this guide for you! Each category consists of two different tuners per form factor, except for the sound hole tuner, in which I only reviewed one. If you need help deciding, take a look at the buying guide section of this post. If you’re looking for a cheap all-purpose handheld tuner that will tune both your bass and guitar, as well as your bandmate or studio musician’s instrument, take a look at the KLIQ MetroPitch. It's a 3 in 1 tuner, combining the functionality of a tuner, a metronome, and a tone generator in one small device, small enough to fit in your pocket. It's ultraportable for studio, lessons, practice sessions, and stage, and a great backup to your main tuner. 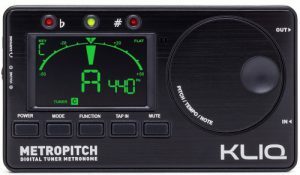 The KLIQ MetroPitch is a chromatic tuner that features a fairly broad tuning and tone generating range, A0 to C8, that can be very useful for tuning high pitch to low pitched instruments (like a bass guitar). You can set the reference pitch (concert A4) to anywhere between 410 to 480 Hz, in successive 1 Hz steps, with a transpose range of C, F, B-flat, and E-flat. There’s even the option for flat tuning (1 to 4 semitones in semitone steps). As a chromatic tuner, you can set it into 5 tuning modes. The default mode is chromatic, useful for any tuning application, and you can set it to tune the strings of a standard 6 string guitar, bass, ukulele, and violin. Each tuning mode will give you a precision of ±1 cent, which is very good for a tuner, and especially for this price. Like I mentioned before, the KLIQ MetroPitch is also a very handy metronome. There is a very wide tempo range of 30 to 250 BPM (beats per minute) with an accuracy of ±0.5 cent. You can also change the time signature if you want to any of the 15 that's programmed into the device. This includes beats of 0 to 9, duplets, triplets, quadruplets and quadruplets with or without the center beats. It has its own dynamic speaker for click making as well as tone generating, and 3 connectors for instrument input, speak/monitor output, and headphones. It’s powered by 2 AAA batteries that come included when you purchase the unit, which will last the device for approximately 40 hours of continuous non stop operation. You also get a nice carrying pouch. The general user review for the KLIQ MetroPitch is very positive. People like that it is low cost, flexible, has a wide tuning range that facilitates different concert pitch variations, and is accurate. One buyer appreciates the style and features, finding that the design made it very easy to navigate, and change from mode to mode. Another owner, looking for a guitar tuner for a 12 string Hagstrom Viking, chose this tuner because of how popular it was. He continues to use the MetroPitch to tune all his guitars “effortlessly.” Finally, another buyer appreciated the fact that it easily replaces two pieces of equipment he has to carry around – a guitar clip tuner, and a metronome, with the tuner being “on spot” and just as good as his clip tuner, yet with an easy to use integrated metronome being handy. The KLIQ MetroPitch is a great little tuner if you need something that’s low cost, but has lots of options, and is easily portable. It may not be as advanced as some of the other professional tuners on this list, but it can do the job well. Recommended for students, hobbyists, and musicians especially. When it comes to handheld guitar or bass tuners, the most highly rated standard is the Peterson StroboPlus HD. In fact, Peterson is a pioneer in instrument tuners, being the first company to commercially release electronic tuners in 1964, with the strobe tuner being their most popular and successful. Grateful Dead, The Who, Pink Floyd, Frank Zappa, Jimi Hendrix, and Neil Young are all musicians who depended on the original Peterson strobe tuners. The StroboPlus HD is their current modern handheld version for modern guitarists and musicians. 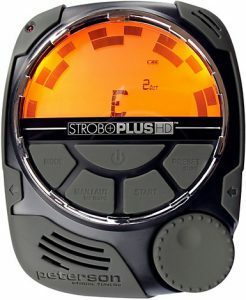 The StroboPlus HD is a chromatic strobe tuner, meaning that you are not limited to a specific tuning system, but you have the exceptional accuracy of a strobe tuner in a handheld device. It has a broad reference pitch variation of 390 Hz to 490 Hz. This would be very useful for certain getting certain detuned sounds found in some genres. The tuning range is C0 to A8, which is suitable for high pitched to low pitched instruments. Being a strobe tuner, there is a very precise accuracy of ±0.1 cent. The tuner has several tuning modes. You can set it to tune guitar, bass, orchestral, ukulele, harp, or sitar, with over 90 presets. Also, you can load and create 99 of your own presets and save them based upon the guitar, instrument, song, and style you want to tune in. This makes it very hand for quickly setup up and tuning, so you’re ready to play or record without too much hang time. But what’s probably the most useful feature is the “sweeten” feature. Since every guitar and every instrument has its own unique sound and variation, StroboPlus HD allows you to achieve the desire “sweetspot” for your instrument for a natural sounding tune best for your own instrument. In addition to the great features, it has an easy to read ultra-bright backlight display, a rotary encoder for fast menu navigation, and through/output jack which will allow you to connect your guitar to your amplifier or mixing board through the tuner. That said, there it also has metronome capability if you download and use the Peterson Connection app to editing the settings. To be expected, the StroboPlus HD has a ton of great user reviews. One said that he’s been using tuners for decades, but since spending the money on the StroboPlus, he’s amazed that all his instruments sound better, thanks to the high tuning consistency across the notes. Another buyer said that the “sweetened” tunings made his Taylor guitars sound “just perfect,” and would recommend it to anyone. Finally, another buyer, a semi pro worship musician, said that after getting this, it was like hearing his guitar in tune for the first time. If you want profession tuning at an industry standard, get this. Naturally, the Peterson StroboPlus HD, as a handheld tuner, is less than convenient than the clip tuners or pedal tuners that I will mention in this post. But when it comes to precision for the money, in a handheld device, it’s hard to beat this tuner. Certainly a recommended buy, for uncompromised results. If you’re looking for the best cheap clip guitar tuners, that’s easy to use, accurate, and flexible enough to tune any other instrument in your studio or on stage, check out the KLIQ UberTuner. Like the MetroPitch handheld tuner that is also mentioned, it’s designed as the perfect low budget alternative to the more advanced tuning systems out there. But don’t let the price fool you, it’s really good quality, making it great for students, beginners, hobbyists and semi-pro musicians that need to quickly tune their instruments. Like the vast majority of tuners on this list, the KLIQ UberTuner is a chromatic tuner. Chromatic tuning allows it the flexibility to be used on many instruments. However, having five tuning modes, you can set this tuner to operate in guitar, bass, ukulele, violin tuning modes. Combine the tuning modes with an advance microprocessor and highly sensitive Piezo Sensor, clipped to the end of your guitar or bass, and you have very quick tuning times. One of the unique things about this, as well as the tuner's is its display. It has a super bright color display that makes it practically impossible to misread. It’s also nice to look at, in my opinion. 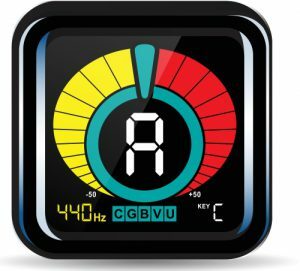 The KLIQ UberTuner also has a broad tuning range of A0 to C8, with a fairly flexible reference pitch of A4 430 to 450 Hz. You can change the reference pitch in degrees of 1 Hz. You also have a transpose mode for transposing C, F, B-flat, and E-flat. Useful for other instruments. It comes with small 3V battery that will power the device for up to 16 hours of continuous use, with audio input. Since it is such a compact, lightweight tuner, it has a strong, durable design, with no LCD screens that’s prone to damage, or flimsy buttons to fall out. The manufacturer is so confident in their design that they will give you your money back if it breaks of stops working on you. The general buyer feedback of the UberTuner is positive. Most tend to like it because of its display, and how fast it can get you in tune, without wading through a lot of options or features. One buyer said that the tuner never left him guessing whether or not he’s in tune, since it has the “best display I’ve ever seen on a tuner.” Another user referred to this device as “pretty fast and slick looking.” Finally, one buyer was so satisfied with his UberTuner, he purchased another one to place in his second banjo case. The KLIQ UberTuner is the tuner to get if you want a no frills little tuner to clip on to your guitar or bass without any fanfare. Between its brilliant display and ease of use, plus cheap price, it's of the best cheap clip guitar tuners you can get. If you’re a pro, or you want pro tuning results in a clip-on device, but with uncompromised accuracy, take a look at the Peterson StroboClip HD. As mentioned, the company that makes the StronoClip is legendary in the music industry, and they continue to be supported by only the best musicians, music tech, and studio engineers who’s in-the-know about these devices. The HD version is actually an upgrade to the older model, which, though massively popular, has been discontinued. The new version comes in a completely modern design and beautiful easy to read modern display that makes tuning easy and super accurate. The StroboClip Clip-On HD is a chromatic strobe tuner, so you’ll have the flexibility of using it to tune a wide variety of instruments and sound sources, with the kind of accuracy that you can only get from a strobe tuner. The reference pitch variation is quite broad. You can select anywhere between 390 Hz to 490 Hz, making it applicable for many different styles of music. The reference pitch itself is broader than the last model. There is also 50 exclusive “sweetener” settings, which allow you to tune your instrument to its particular sweet spot for a natural feeling tune. This can be done on any note from C0 to B6, at an accuracy of 0.1 cent. The display is one of the best things about the new version of the StroboClip HD. The tuner uses an HD very bright backlit LCD display that makes it much, much easier to read than the predecessor, especially in dark environments. And thanks it being housed in a very tough plastic chassis, it can withstand tough touring sessions. The tuner doesn’t use a microphone, but relies on a Piezo, and you can use the Peterson Connect app to configure its settings. You shouldn’t be able to go wrong with the Peterson StroboClip HD. It’s great for everything from classical guitar to pedal steel guitar, and everything in between. It’s used by the best who expect the best results, and at decent, affordable price, too. Check it out! Do you want to strum your guitar strings once and tune them all at the same time? With a polyphonic tuner, that is possible! One of the best polyphonic tuners in existence now is the TC Electronic PolyTune 3. The original PolyTune came out in 2010 and really took the guitar tuner to another level. The ability to strum all strings once, then tune, means a less meticulous tuning experience. And with the built in buffer, your signal is kept strong, clear and uncompromised throughout the signal chain. 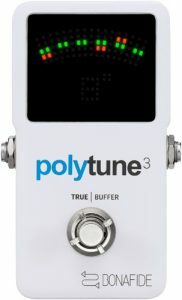 The result is, well, more guitarists and bass player grabbing the PolyTune as their go-to pedal tuner, with the PolyTune 3 being the most advanced version they have yet. The TC Electronic PolyTune 3 is a pedal format tuner that’s also a strobe tuner and a chromatic tuner. You can, if you want to, switch between polyphonic tuning and chromatic tuning. In chromatic mode you get an accuracy of ±0.5, and in strobe mode you have an accuracy of ±0.1 for surgical precision. The reference pitch is selectable, which gives you perhaps the greatest flexibility in its class. The pedal tuner also has a smart feature “MonoPoly” which will instantly recognize whether you’ve played one or several strings. In return, it will display either in polyphonic and monophonic tuning modes appropriately. And in addition to the chromatic and polyphonic modes are the capo and drop tuning modes. The True Buffer or True Bypass modes give you two options when using the PolyTune 3 in your signal chain. True Bypass allows for sending the signal through your tuner even when you’re tuning. This is a useful configuration -- many have found that bypass pedals can rob away a little of the top end of your signal. For that reason, PolyTune 3 has a True Buffer option, which allows you to preserve what you may have lost through the signal chain, without any added color, while the tuner itself remains perpetually on. TC Electronic PolyTune 3 is, as a pedal, one of the best guitar tuners reviewed out there for the money. For the price, it does a lot more than what a typical pedal tuner will do. And in a long signal chain, its buffer adds value by bringing your tone back to its original pristine sound as well. Definitely, it’s one of the highest recommended tuner pedals out there for professional results – you can’t get it wrong with this one. When it comes to industry standard tuning, you’ll see the Peterson name over and over again (as you have seen in this list). The Peterson VSS-C StroboStomp Classic is a pedal tuner that’s made for guitar and bass and other stringed instruments. The StroboStomp gives you strobe tuner accuracy that’s not paralleled with other systems. But on top of that, there’s the Peterson “sweeten” modes for tuning your instrument to its sweet spot, plus the ability to configure it via your PC or Mac. There’s even an onboard professional active DI (mutable) where you can select 3 stages of attenuation. What you get is a true bypass pedal that promises absolutely no coloration in your signal chain. The StroboStomp is modeled on the world-famous Conn ST-11 analog tuner, but comes as a stompbox model for your pedalboard. The StroboStomp is a chromatic strobe tuner with a precision of 0.1 cents. Like many of the other models that they create, there is a broad reference pitch range of 390Hz to 490Hz (concert A4), with a note range of C0 to A8. Which is great for tuning most genres of music and different types of stringed instruments. That said, it also has the Buzz Feiten Tuning System support, as well as drop tuning/capo tuning automatic transposition. Perhaps the biggest selling point of the StroboStomp, is its flexibility. There are many tuning presets that you can create and save, and even edit from your computer. Each preset allows you to save the specific sonic sweet spot for your instrument, whether it is bass, guitar, steel pedal guitar, bluegrass guitar, classical guitar, 7-string bass, banjo or mandolin. The device is also easy to use as well, mostly thanks to its large, high-contrast display. The display is capable of being visible even in direct sunlight (great for outdoor festivals). The construction is rock solid, made out of a heavy duty, die-cast chassis with a durable stomp switch. The typical customer review for the StroboStomp is very good. Most people appreciate the rugged design, plus the addition of the DI making it a great value buy. One customer found that this pedal was a real winner when it came to setting his own tuning preset via USB on computer for his steel guitar, “a very touchy instrument for tuning.” The StroboStomp passed with flying colors. Another professional music tech found that the StronoStomp was the most accurate tuning device he’s ever used, giving him fast and professional results in the studio… especially at those crucial times when he was “in the moment” and didn’t want to be interrupted by a meticulous tuning process. A final buyer loves its “monitor mode” on bypass, with no sound coloration and continuous visual feedback, displaying how in-tune he is for entire sessions at a time. 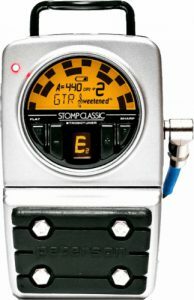 The Peterson VSS-C StroboStomp Classic may be a fairly pricey tuning pedal, depending on how you look at it. But if you want to get truly uncompromised results for your studio, you can’t go wrong with the apparent champion. Certainly recommended for professionals and series enthusiasts. If you primarily play a standard 6-string acoustic guitar, especially if it's one that doesn't have a line out and needs to be connected to a good guitar microphone for sound amplification or recording, this low cost acoustic guitar tuner is the one to get. The Korg Rimpitch is designed to fit right into your sound hole for a seamless, always accessible, yet very discrete tuning experience. Especially if just practicing, or doing an acoustic set, having a tuner that fits conveniently right inside your sound hole seems to make a lot of sense. Also, with its super convenient viewing angle, if you can look at your hand while strumming, you will see if you're in tune or not. The Rimpitch is an acoustic guitar tuner… meaning, unlike chromatic or polyphonic tuners, the tuning setting is always based on the strings of your acoustic guitar. When you look at the tuner, you will see a series of six notes that lights up red based on the string you want to tune: E, A, D, G, B, and E. Another green light checks for accuracy of your selected string’s pitch. And the tuner is quite accurate, with a precision of +/-1 cent on a reference pitch of 440 Hz. The Rimpitch also uses a battery which can last up to 12 hours of continuous tuning. If you’re wondering about whether or not it will fit in your guitar's sound hole, check the size: standard acoustic guitar sound holes with a diameter of 100 mm will fit the Rimpitch, give or take 3 mm. The nice thing about the Rimpitch that I like, is that the configuration allows you to check your tuning without your audience even noticing, since the tuner will be within your natural line of sight. It’s bright LED lights also make it easy to read, whether in a dark room, or outside in the bright day on camping trip or in the park. Also, because it can stay in your sound hole, you can leave it in for easy packing. No need to go looking around for the tuner when the tuner is already discretely clipped onto your guitar, safe from sight or damage. At the time of the post, about 83% of buyers on Amazon give the Rimpitch 3 to 5 stars, with over half of the user leaving a perfect 5-star rating. Most like its accuracy and its convenience. Those that didn’t found that it wouldn’t fit properly (so it’s important to measure your sound hole before you decide on buying the tuner). One buyer found that it helped him to tune even in a loud room. Another was so satisfied with his first Rimpitch he got 2 more for his other guitars, and a next buyer said he loved being able to tune discretely mid songs. The Korg Rimpitch is a great alternative to the typical guitar tuners out there – pedal, handheld, clip-on, etc. It has some limitations, sure – no chromatic tuning, stationary reference pitch, and one sound hole size fitting – but the trade-off is apparent: convenience, practicality, and accuracy. It’s a very pragmatic tuner for acoustic guitars, and one of the best sound hole guitar tuners you can buy. Take a look! If you’re looking for an affordable rackmount guitar tuner for your home studio or live rig, check out the Korg pitchblack Pro. Korg was the first to come out with the concept of a rackmount tuner back in 1987, with the DT-1pro. The original tuner was a big hit, and proved to be advantageous over the typical handheld/pedal/clip-on tuner setup because of the additional powerful features and convenience to be stored on a stationary rack space. With the new model, the pitchblack Pro adds one of the easiest tuning visibilities with its "3D" meter, 3 viewing modes, and a handy cable checker. The pitchblack Pro is not just for guitars, it’s also for bass. It’s a chromatic tuner with a wide tuning range of E0 to C8 with 12 note equal temperament. You can change the reference pitch from the standard 440 Hz to anywhere between A4 436 Hz to 445 Hz. It’s also very accurate, with a precision of ±1 cent which is very good for a rack tuner of this price. It has two inputs for instruments, line output, and is powered by a 9V DC power supply which comes with the rack unit. The most convenient features are yet to be mentioned. First the display -- because you’ll want easy visibility, it gives you a large 3 dimension meter for 3 display modes. You can watch your tuning in regular mode, which is the typical needle mode you might know of (watching the LED light move from right to left until you get the right pitch in the center). There is the strobe meter mode, which is often considered the most accurate, and then there is the half-strobe mode. But the other great features is its Cable Checker, that will warn you if you have a broken or shorted cable in your signal flow. You'll find this convenient in helping to avoid any audio signal problems in the studio or on stage. In addition to that, is the pitchblack Pro’s Buffer Output, which minimizes any degradation in audio quality, and restoring the signal where necessary. You can also mute the tuner, so you can tune your guitar or bass in between songs without producing any sound. The majority of owners of the pitchblack Pro are happy with their purchase. Mostly because of the convenience of having a stationary tuner with buffer and cable checker on a rack space, and for its low price. One buyer enjoyed the accurate tuning and ease of use. Another said he found it great for tuning seven string instruments by placing it at the top of his guitar rack, that way he didn’t have to deal with a bunch of pedals. Finally, one customer said that it looked beautiful in his studio, happy that the lights makes it easy to see. The Korg pitchblack Pro is the recommended rackmount tuner to get if you want something a little on the “affordable” side of your budget. It’s become an industry standard in its own right, and you can’t go wrong with that. If you’re willing to spend the money on one of the most accurate and rack tuning systems on the planet, take a look at the Peterson VS-R StroboRack. If you’ve noticed, the Peterson name keeps coming back up in this guide. They make some of the best tuning equipment in he world, being the originator of the commercial electronic tuner, as well as used and trusted by the best guitarists, bassists, and studio techs around. As a rackmount tuner, the StroboRack has some advantages that is suitable for a studio environment. But add to that the super precise Peterson strobe tuning system, and Sweetened tuner settings, and this is perhaps the best rack tuner you can buy. The Peterson VS-R StroboRack is a chromatic tuner with strobe tuning. So you’re not going to be limited to just one specific tuning system. Like all the other Peterson tuners in this guide so far, you can change your reference pitch of A4 from 390 Hz to 490 Hz. With one of the largest reference pitch variations out there, it’s suitable for wide variety of musical styles, genres, and guitar and bass instrument tuning systems. You have a wide tuning range of C0 to A8, and an accuracy of ±0.1 cent, which, like the other Peterson tuners, is the most accurate in its class. You'll find all of this accuracy clearly visible on the LCD display, which shows the strobe tuner, making it super easy to read from any distance. But the display also has another cool trick -- you can program it with customizable scrolling text to display messages for your audience and fans. The StroboRack is one of the best tuners for pedal steel guitar, bass guitar, electric, mandolin, banjo, orchestral guitars, you name it. Thanks to its 35 tuning modes, you can set it to whatever type of guitar you wish, and forget it. Even if you’re on an acoustic guitar, this will be useful, since it has a built in condenser microphone for active pickup. With the modes you can save 25 presets for quickly getting your recordings ready. It also has 8 programmable “Sweeteners” for tuning your guitar to its most natural frequency. You can use Buzz Feiten Tuning System, with open string and intonation settings as well. The rack also has a D.I. built in, with channel switching options for you thanks to the un/balanced stereo/mono connectors. If you don’t want your fans to hear you while you tune, press the mute button. And there’s a remote jack, in case you wanted to connect a stomp box to it. The majority of owners of the VS-R StroboRack think that it’s the best tuner ever. One owner said that all guitars that comes into his studio goes through this “before anything happens. It tunes, it intonates” and much more. Another buyer found relief with this tuner when it came to tuning his steel guitar. Finally, one more customer found it tracks very quickly and is “insanely accurate,” his friends come to his studio to work on their guitar’s intonation. You can’t go wrong with the Peterson VS-R StroboRack. You get the classic Peterson accuracy, intonation, and a bunch of other rack gear goodies for the money. If you can afford it, this is rack guitar and bass tuner to get. If you want the ultimate tuner for your guitar or bass, or any instrument for that matter take a look at the Peterson AutoStrobe 490. It’s the original analog classic strobe tuner used by professionals in recording studios, schools, and instrument makers, as well as enthusiasts. With this tuner you get mechanical analog strobe disks that give you real time tuning feedback at reliable precision. There is no LCD screen or otherwise digital emulation of your audio signal’s pitch. This strobe tuner actually physically registers and displays how accurate you are tuning your instrument, allowing you to properly tune and correct any intonation issues on your guitar with professional laserlike precision. The AutoStrobe 490 is a chromatic tuner that can be used to tune any instrument, but it has specialized tuning presets for guitar, bass, and six historic temperaments including Pythagorean, Just Major Intonation, Quarter Comma Meantone. It has the broadest reference pitch variation of all tuners on this list. With 350 Hz to 550 Hz, there’s a lot of flexibility in terms of where you want your music to sit. It also has the super accurate precision to keep your instruments in tune within 0.1 cent playing every note from C1 to B8. If you need to, it can also transpose your tuning systems from your A4 setting to C, B flat, F, and E flat, which is very useful for tuning various instruments. And if you are tuning an acoustic guitar without a line out put, it comes with a high quality built in microphone as well. The analog display uses mechanical discs with a bright backlight that makes it easy to see from any viewing distance. This is definitely good if you’re you plan on using it on stage. And at the back of the device, there are external inputs with a through-line output -- you can run your instrument through it to your speakers of mixing board, with a continuous monitoring of your instruments tune. And if you don't want others to hear you while you are tuning in between sets, there is the capacity for silent tuning thanks to its mute button. Finally, like all the other Peterson tuners on this list, this analog tuner also gives you a set of sweetened tuning settings (eight in total), plus a total of 64 user presets to store and save your own custom tunings. The tuner has a 100% 5-star customer rating on Amazon and other online stores. The general feedback is on the reliability and accuracy that the tuner provides. One customer, a repair shop owner for Buzz Feiten guitar retrofits, said that since getting the tuner, none of his customers ever complain about intonation issues when they plug their guitar in. Another owner, a woodwind instrument maker, found that the ability to measure accuracy to a thousandth of a semitone was seriously useful. Finally, another customer found the tuner reasonably priced regarding its power and abilities. The Peterson AutoStrobe 490 is probably the best guitar tuners there is on the planet, and for the money as well. If you are serious about getting perfect results, you can’t beat this tuner for the price. Some may find the accuracy to be overkill, but the super accuracy pays dividends in saving you and giving you peace of mind that it can handle anything. Check it out! If you're a musician, a studio owner, music tech, or you make instruments, a tuner is one of the most important gear you can have. A good tuner will be able to identify if your instrument is out of tune, and correct you with the precision of the standard tuning system (usually A4 440). Once you get into the world of tuning, though, it'll feel like a modern alchemy. Some have the gift of absolute pitch, others have to rely on acquiring the skill of relative pitch. In either case, human beings have the capacity for error, with plenty personal judgements and preferences to boot. And if you're an experienced musician, you'll know what effect a certain tuning systems has on your music. Especially if you're a guitarist. A tuner is your uncompromising and impartial judge keeping the law in Pitchdom. But tuners come at different grades and levels. From basic tuners, to tuners with Pythagorean tuning (Wikipedia article), and correct intonation issues. That said, the tuner of the enthusiast or semi-pro, the tuner of the student, and the tuner of professional are not going to be the same. Each one has its benefits and use. Let's go through the various types of tuners to figure that out. Form factor, of format, simply refers to the physical dimensions of the unity you will be getting. The size and shape will have a lot to do with the intended purpose (outside of just tuning guitars), and each type of form factor will make the tuning experience convenient for you in some way. There are six different form factors to choose from. Each one has a particular benefit. Like the name suggests, they are small enough to be operated in your hand. They are usually small and portable, therefore easy to carry around and store in your pocket or guitar case. Handheld tuners can be used in acoustic setups, on stage, and in the studio. A "hands-free" tuner, made to be clipped to your guitar's headstock. Being position on your guitar's headstock gives you a convenient viewing range while you adjust the tuning pegs. Clip-on tuners can be used in acoustic setups, on stage, and in the studio. Like your other guitar pedals, these tuners fit go into your pedalboard to give you another great "hands free" tuning convenience. They listen to the signal in your guitar's signal chain, often giving you the ability mute the "through" signal for silent tuning between songs. Pedal tuners are used in acoustic setups (with a guitar microphone), on stage, and in the studio. Very convenient for acoustic guitars. They clip on to the rim of your sound hole, providing you with a very convenient and discrete tuning experience of your acoustic guitar. Sound hole tuners can be used in acoustic setups, on stage, and in the studio. If you use a touring rig or a rack in your studio, a rackmount tuner gives you the advantage of a stationary device. Rack tuners also come with powerful options not often found on the typical tuner device. They can be found used in acoustic setups (some with their own internal mics), on stage, and in the studio. Larger than handheld tuners, and therefore more powerful. Great for workbenches and studios. Desktop tuners are also used in acoustic setups (with their own internal mics), on stage, and in the studio. A guitar generally has 6 strings to tune: E-A-D-G-B-E. But bass strings are usually just four in number, and you may also know that there are a variety of tunings for different kinds of guitars, like drop D tuning, capo tuning, and so on. Several tuners will give you the choice of selecting a tuning style, and assist you in the process. But because there are so many to list, I 'm just going to cover broadly three main types of tuning modes that will facilitate your specific tuning styles. These tuners only allow the tuning of the open strings of the guitar E-A-D-G-B-E. If you know that the only guitar you will be tuning is a six string, and your playing only requires E-A-D-G-B-E open string, this may be a good low cost option. By far the most popular and favorite option. Chromatic tuners allow you to tune in any tuning system, since all 24 notes will be registered. Chromatic guitar tuners also have the option to switch between the string tuning styles I mentioned, including bass, and other other stringed instruments. A relatively new addition. Polyphonic tuning allows you to tune all strings at once. Just strum and tune... very convenient. Especially when going tuning on the fly. The reference pitch is almost always going to be A4, also called "Concert A." It's the tuning center from which all the other notes derive their accuracy relative to it. The standard tuner uses a reference pitch of 440 Hz at concert A4. You'd find this useful in general application, but having a wider reference pitch option allows you to tune your guitar to more precisely match the music or the other instruments you're playing with. For that reason, many guitar tuners give you the benefit of choosing where you "concert A" will be, whether 430 Hz, 450 Hz, and so on. This is also especially good if you need to tune non-mainstream guitar music, such as world music, or period music. That's about all the essentials you need to know before you decide on what's the best guitar tuners. 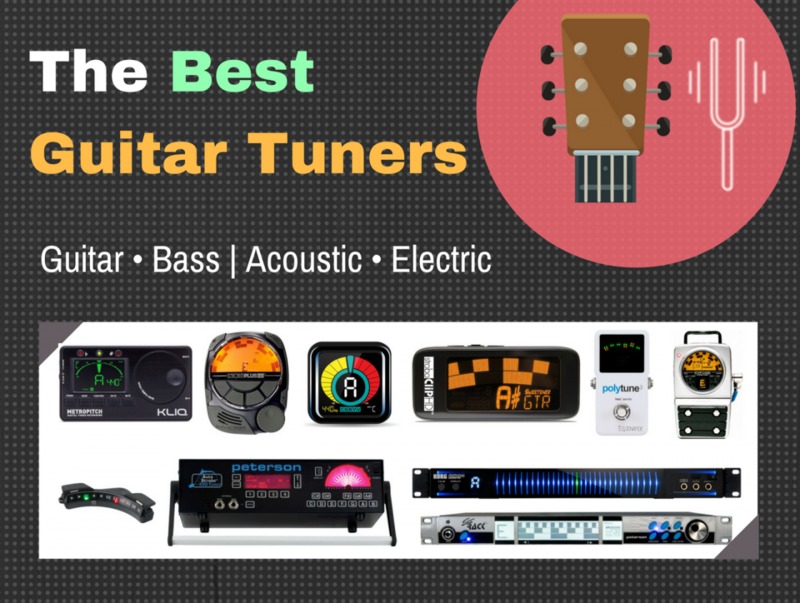 Keeping these things in mind when looking for the best guitar tuner for your guitar and bass. If you've read all the way down to here, you're probably now more acquainted with a guitar tuner than the average musician generally is. You would've found out that there are quite a few options for you, with lots of styles and varieties, and as well as options of what a tuner can do. 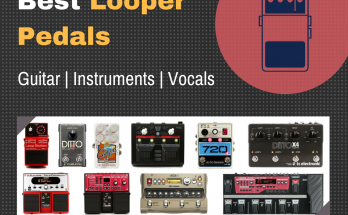 This 10 best guitar tuners guide is really a framework in which the best tuners were collected, analyzed, based the most popular and recommended tuners, to create a benchmark of tuners per type and price category. This is to make the buying process as seamless for you as possible. If you were reading this out of curiosity, feel free to leave a comment below. Do you have any of the tuners on this list? Are there any other tuners that you think might've made the list? Let us know in the comments below and get the discussion going. Otherwise, share the love! Link this page off to a friend or someone you know who might find this information useful. How did we came to these results? Writing this guide was the result of many hours and over a week of researching online what are really the best guitar tuners out there. Our sources were mainly online music gear stores, and pro audio forums. We compiled a list of the best rated and most popular guitar and bass tuners, and used some personal experience where applicable. 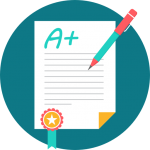 we also read through a compilation of user reviews, product reviews, and organized and categorized the best tuners based on their price point to specifications ratio. The result is a list of awesome guitar and bass tuners, across the budget, for advance to beginners.